Basseterre, St. Kitts, February 14, 2018 – CNN has listed the Park Hyatt St. Kitts as top of the 14 best new hotels and resorts opening in the Caribbean. “1. Park Hyatt St. Kitts, St. Kitts & Nevis – This splashy five-star resort isn’t just the first Park Hyatt on St. Kitts, but the first Park Hyatt in the Caribbean. 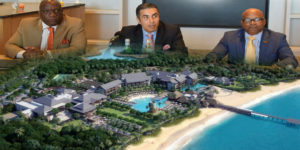 Luckily, the fall hurricane season spared tiny St. Kitts, allowing the 127-room property to open this past November in a remote section of the undeveloped island. Those wishing to venture off-site have their pick of outdoor activities, including volcano hiking, but the Park Hyatt can also arrange trips to the UNESCO Brimstone Hill Fortress or provide an island historian for a truly local experience,” said the article which lists the other 13 hotels and reports. The other hotels and resorts on CNN;s list are: 2. Baha Mar, Bahamas; 3. The Other Side, Bahamas; 4. Jewel Grande Montego Bay Resort & Spa, Jamaica; 5. Serafina Beach Hotel, Puerto Rico; 6. Gran Hotel Manzana Kempinski La Habana, Cuba; 7. Turks Cay Resort and Marina, Turks and Caicos; 8.Hodges Bay Resort and Spa, Antigua; 9. Quintessence Boutique Resort, Anguilla; 10. The Loren at Pink Beach, Bermuda; 11. Pink Sands Club, Canouan, St. Vincent and The Grenadines; 12. Silversands, Grenada; 13. The Shore Club, Turks and Caicos; 14. Bahama House, Bahamas.